Chris Ayres on the Wilshire Boulevard practice that's a sanctuary for Tinseltown's follically challenged stars. Aside from the words "Alvi Armani" etched into a smoked-glass partition, the entry lounge of the tenth-floor suite at 8500 Wilshire Boulevard - located above a nondescript bank branch on the edge of Beverly Hills - gives no hint as to what goes on beyond the unmanned reception desk. There's just a sofa, a vase of purple orchids, a flat-screen TV and a coffee table with a glossy magazine placed on top at a perfect right angle. Such meticulous anonymity - there are no product brochures on display, no informative posters, no slogans or branding of any kind - makes you wonder for a moment if you might have found yourself in a field office for someunofficial branch of the CIA. The real explanation, however, involves a matter of far greater delicacy. Here in this suite, an unspeakable taboo is confronted, often after years - decades, even - of private anguish. In many ways, it is a place of Ultimate Reckoning: where the impossibility of death in the mind of someone living - as Damien Hirst so memorably put it - meets the unyielding reality of human decay. Yes, Alvi Armani is a clinic... for balding men. And not just any men, either - but some of the richest and most prominent individuals on the planet. If the name "Alvi Armani” sounds familiar, it's most likely because of the alleged patient who was recently caught by paparazzi climbing into a limousine in the facility's underground garage - one Gordon Ramsay, of Kitchen Nightmares fame. In the photograph, the Michelin-starred chef was fitted with a surgical cap and looked dazed and puffy-eyed. "Gordon Barnet!” sniggered The Sun. 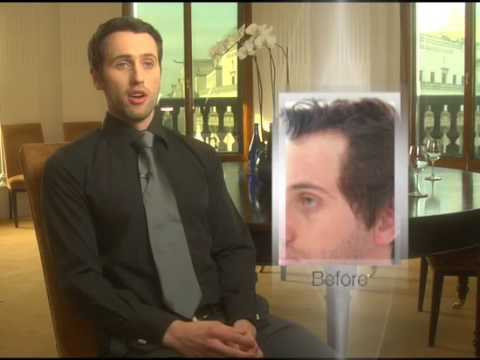 In spite of such jeers, however, the Armani clinic - founded by the esteemed Italian surgeon Antonio Armani (unrelated to the clothing designer of the same name) - is at the follicle-tip of a revolution in so-called "hair restoration” technology that is already well on the way to eliminating baldness in notable males of a certain age. Its secret? The treatment is pre-emptive. Plus, the new hair grows in over 18 months, which is why, if not for the occasional enterprising photographer, the work goes mostly undetected. Although it is impossible to know who has had the procedure, the statistical fact that two-thirds of males should by rights have lost their hair by the age of 60 doesn't make it hard to guess. John Cleese, now 71, is one of the few who've come clean, explaining that he got a transplant because, "I've got a very strange-shaped skull, very pointy, and I don't like wearing wigs.” In fact, the shock these days is more when men don't take action - hence the recent serious-minded reports on Prince William's scalp by the Associated Press, and the incredulous whispers in Hollywood whenever Hugh Laurie gets his thinning crown touched up with a spray can on the set of House, M.D. "I would say that more than 90 per cent of everyone you see out there has had it done,” says Dr Baubac Hayatdavoudi, the 35-year-old surgeon who took over the Armani clinic in Beverly Hills two years ago, when I ask him to guess how many suspiciously hirsute celebrities have undergone some kind of major scalpwork. "They just come here before it gets obvious. It used to be a taboo in this business to treat young people. It was always, y'know, ‘Let's wait and see how your hair loss progresses...'” Well, not any more. It was Hippocrates, the father of modern medicine, who made the first scientific observation on the subject of baldness when he reported that of all the Ancient Greek men in 400BC, only the eunuchs never receded or thinned. He didn't know why, of course. But we do now: men castrated before puberty don't produce testosterone, and therefore neither its evil mutant offspring, dihydrotestosterone, or DHT. It is DHT that acts like Kryptonite on men's follicles, but only if those follicles have been equipped with so-called "DHT receptors”, a factor decided without consultation or appeal by the cruel lottery of genetics. Before such things were known, "baldness cures” were nothing of the sort, really. Hippocrates treated his own dying rug with everything from sheep's urine to horseradish, cumin, pigeon droppings and nettles. It took a couple of millennia for the first big advance in follicular treatments to arrive - the 1804 experiment by an Italian doctor, Giuseppe Baronio, that involved cutting a strip of skin from a living sheep, then grafting it back on to the unfortunate creature 80 minutes later. To everyone's surprise, the skin survived - thus proving that "autografts” (removing skin from one part of the body and moving it to another) were viable. From here the action moved to Germany, where in 1914 a doctor named Franz Krusius used the same principle for a successful eyelash transplantation, and then to Japan, where Shoji Okuda announced in 1939 that he had performed some 30 hair transplants using various jerry-rigged circular punches of between 1.5mm and 5mm (they were driven into patients' scalps using nothing but "force and rotation”). Because his work was published in Japanese just before the Second World War, it took decades to reach the West. In the meantime, however, a New York dermatologist, Norman Orentreich - now 89 years old - discovered in the Fifties that hairs on the back and sides of the male head were immune to the influence of DHT, and that if sections of scalp were removed from these areas and grafted on to a balding pate, they continued to grow healthily. "Donor dominance” was the term he came up with, and it has been the founding principle of hair-loss surgery ever since. There was a big problem with all of this, however. When clumps of 30 to 50 hairs were cut out of a patient's scalp and relocated - sometimes with the punch attached to an electric drill, to speed things up and increase profitability - they created scarring at the donor site, not to mention those unnatural-looking "plugs” of hair in the area being repopulated. As a result, various work-arounds were attempted, mostly with disastrous consequences: "scalp reductions” (the scars resembled axe marks); "hair flaps” (there was risk of oddly angled hair and, in some awful cases, "flap death”, or tissue necrosis) and "micrografts” (splitting grafts into smaller pieces). Some of these procedures were still being offered in the Nineties. Then finally came the "strip method”, whereby all the donor hairs were "harvested” in one go by cutting out a long, rectangular section of scalp from the back of the head and sewing the gap shut. The donor strip was then split into micrografts and planted into holes on the top of the head made by a scalpel nick. It was a relatively clean technique with half-decent results, but still left a "happyInside faced” scar on the back of the patient's head, ruling out short haircuts. This is where Dr Armani comes in. Basically, he founded his business in 1999 with the aim of harvesting only individual "follicular units” - made up of one to four hairs plus the surrounding oil glands, muscles, and connecting tissue - using tiny, needle-like pricks in the donor area. Each follicular unit, also known as an ultra-micrograft, is then transplanted to the top of the head using a tool like jeweller's forceps. Scarring is barely detectable, even with very short hair. Also, fewer hairs are lost during harvesting, and therefore "transplant density” is improved. Most importantly, the pluggy look doesn't happen - or at least not in theory. "In this clinic, plugs are a dirty word,” says Dr Hayatdavoudi. For privacy reasons, The Times isn't allowed to sit in on one of Dr Hayatdavoudi's consultations, but fortunately a test subject is on hand in the form of... well, your very own correspondent. I keep my hair closely shaved - after it became obvious in my mid-twenties that it was staging a retreat on all fronts. Thankfully, by then, the semiskinhead look was acceptable (thank you, Jason Statham and Bruce Willis) so I bought some shears and haven't thought about it much since. In fact, baldness came as something as a relief, given that I had been cursed in the first place with fluorescent ginger hair. Clearly, for Dr Hayatdavoudi, this business is personal. He tells me that he began losing his hair in his midtwenties, pretty much at the exact moment he'd finished his medical studies and could finally relax. Like many of his patients, he soon entered the realm of "extreme styling” to conceal his loss. "I do a lot of yoga and other outdoor stuff, so it was really...” - he struggles to find a word - "bothersome.” You also get the sense that his family's Iranian culture wouldn't have been cool with the Buddist monk look, although with his strong features and athletic bearing, he could surely have pulled it off as well as anyone. So in 2003, at the age of 27, he had his first transplant, performed by Dr Armani himself. And when the hair further back on his scalp began to thin 14 months ago, he had a second operation. The result is impressive enough that you'd never question it, as long as you didn't know what he did for a living. As it is, there's a certain level of perfection to the hairline that made me suspect from the beginning that he might be one of his own patients. For the near future, then, the choice for men with underendowed scalps is a simple one: the buzz cut or the surgeon's knife. And, of course, the earlier any action is taken, the better - because these days, no one need ever know what happened. Which brings Dr Hayatdavoudi to the subject of England's future king, Prince William - and whether or not his horse has already bolted in that regard. "He actually has a great donor area and would be a great candidate,” he says. Alas, however, it's unlikely that even the Alvi Armani clinic, with its unmarked doors and security detail in the car park, could handle such a client. "A VIP session would be best suited for him,” agrees Dr Hayatdavoudi, apparently unfazed by the prospect of an in-house transplant at Buckingham Palace.